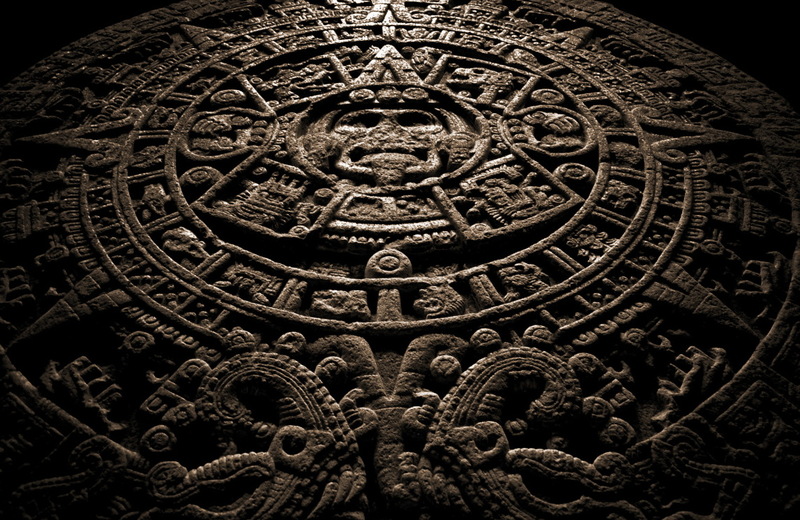 The Mayan Calendar ended yesterday...we didn't. a student of ancient cultures to boot. He chided people all through the past year for repeating that thing about the Mayans saying the world was going to end (yesterday, as it turns out), telling them that the emergence of that idea was based on the ignorant theory of the Apocalypse. According to his studies, what’s going to take place—is, in fact, taking place, as we speak—has to do with the other root meaning of apocalypse: namely, a revelation. According to him, December 21 marked the start of a new, enlightened era in the evolution of Man. As of yesterday, the secrets and meaning of life will start to become clear to us all. Man will become more compassionate, more visionary, more in harmony with the world and his fellow human beings. The world, in short, since yesterday, will start living an aggiornamento that will, precisely, pull us back from the brink of self- and mutual destruction and lead us toward a state of grace in which everyone will work together for the common good. He further subscribes to a theory upheld by a number of obscure if clearly erudite anthropological researchers who, casting aside the findings of Richard Leakey and other noted scientists, claim that the origin and development of Man was just opposite to conventional belief. Man, these scholars say, didn’t first appear on the plains of Africa and then (for some inexplicable reason) make his way to the frigid north, only to then cross the Bering Strait and head back south, creating and leaving behind a string of Native American cultures in his wake. 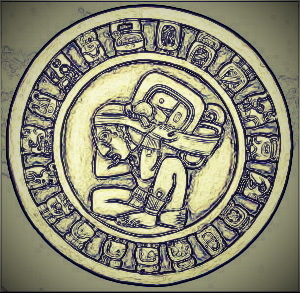 Instead, they say, Man originated in South America (Argentina, they believe), the precursor of the Inca, the Maya and the Aztec, and spread his culture northward, also becoming a great navigator and crossing vast oceans to sow the seeds of the civilizations that were to emerge in Minoan Crete, Phoenicia, Egypt and the Indus Valley.So, anyway, according to that theory, the Mayan Calendar is all about revelation, not destruction, and, if it is to be believed, Argentina might very well be the center of world culture and, thus, the very nucleus of the revelation that we should all be starting to experience as of yesterday at about twenty-four hundred hours, hora argentina. I would really like to believe that theory. Really! Because, that would mean that I was living in the very epicenter of a marvelous new world of love, harmony and mutual respect and that I had something more edifying to look forward to in my old age than a plummeting decent into the inferno of human apocalypse in which all bets are off and we are back to a scenario of stick-wielding, rock-throwing survival of the fittest. Unfortunately, the scene that Argentina woke up to on the morning of Friday, December 21, 2012, did little to support either of those theories and certainly did much to create a climate of apocalyptic chaos and anything but harmony. And the molten core from which that sensation emanated was right here, in the Andean mountain resort town of San Carlos de Bariloche, just 12 miles from where I live hidden away in the forest. Added to this sensation, we now have the December 21 Syndrome, which manifests itself as organized looting, but which has some much larger purpose behind it. The detonator was located, as I say, here in Bariloche. First thing in the morning of an unseasonably cold, wet business day (December 21 is also the summer solstice in South America, but it was only a few degrees above freezing out), well organized looters marched mob-style out of their nearby neighborhoods on the rough Patagonian highlands surrounding the city and made their first incursion into the parking lot of the Changomás (Walmart) supermarket, which quickly became a sorry symbol and victim of this recurrent brand of terrorism. This was ironic, since before the arrival of Walmart, many of the working class and poor people who live in that windblown area far above the touristy Andean city whose downtown image graces postcards, posters and calendars, had to take a bus down to town to do their shopping. Local supermarket chains had long ignored that area because they saw it as a market with too low a level of purchasing power to bother with. But they raised the roof when they heard Walmart had plans to come into town and set up out there, and tried to foster a municipal ban to keep the international chain out. A referendum was finally held and the City Fathers lost, as lower-class segments of the population (who far outnumber the well-to-do) overwhelmingly supported having a major store in their neighborhood. The compromise was Changomás (different name, different colors, reduced stock of merchandise: no Superstore for Bariloche). But then, as I say, the Friday attack wasn’t about social unrest. It was all about political skullduggery. Though driven back by vastly outnumbered and ill-equipped police (who used the store’s fire hoses, hockey sticks from its sports department and wooden curtain rods from the dry goods section to repel the attacking hoards), the rioters simply regrouped and returned, stronger than before, eventually overpowering all resistance, destroying the shopping center’s entrance, showering defenders with a hail of stones and other projectiles, flipping over cars in the parking lot or demolishing them where they stood, and even using one as a battering ram to knock out the store’s front doors. Once inside, although some did help themselves to food items, the real objects of their affection turned out to be clothing, electrical appliances and electronics (especially plasma TVs that went like proverbial hotcakes). So much for the argument about “the desperate hungry people” who had requested “Christmas food baskets”(see below). take out the front doors of the store. Two years ago Bariloche was also the scene of rioting, which ended up with police shooting dead three of the violent demonstrators. Subsequent action taken against the police for being too quick on the trigger has brought ever more strict controls to bear on officers, which would tend to explain why in yesterday’s incidents cops were seen defending themselves by merely hurling back the same rocks that rioters threw at them. Some policemen were even seen using slingshots to return fire on looters who were armed with similar archaic weaponry. The flimsy excuse for the attacks was that the “social sector” had called on the city’s government to convince supermarket owners to donate “gift packages” of food (in the holiday spirit, you understand) to the poorest segments of the population so that they might have a merry Christmas, and that no answer to this “request” had materialized. So Christmas quickly became a sort of terrorist-style trick or treat. But it quickly also became clear that the attempted extortion and its aftermath were neither random nor isolated. 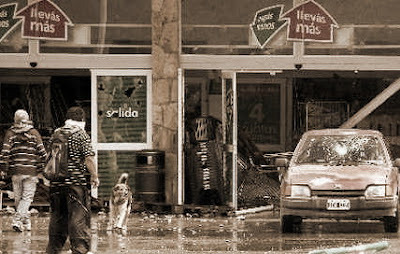 Before people in Bariloche had a chance to even ask themselves if the problem was simply homegrown and the result of rich and poor living in such close proximity, the same scenes of violence, vandalism and larceny were being replicated in ten other provinces around the country and in suburbs of Buenos Aires, where looters attacked not only major supermarkets but also service stations and other stores. Scores of police and civilians have been hurt in the riots and two men died in the city of Rosario (one of a gunshot wound, the other after being knifed). The question most people are asking themselves is, if these actions are politically organized—and they clearly are—whom could they possibly benefit? Could it be the dissident trade unions that once again held a protest this past week and demanded that the government of President Cristina Kirchner stop overtaxing workers’ pay and start doing something about the rampant inflation that is making it harder and harder for laborers to cover their basic needs? If it were, it would surely provide President Kirchner with a clear message about what a mess the unions could swiftly turn the country into if the government were to continue to ignore its demands for higher pay, decent retirement benefits and other worker entitlements. Could it be the far left, which, having thrown in its lot with the dissident Peronist unions still has been unable to convince the middle class opposition to join forces with it? The middle class that mustered a million well-behaved and respectful protesters of its own last November isn’t ceding control of its own destiny to either the government or the dissident left and is standing its ground alone in the middle. Certainly this kind of lightning mass terrorism might be seen as a possible way of scaring both the government and the middle class into resigned acquiescence. Could it be dissident Peronist politicians and strategists? There are clearly segments within the ever eclectic, cloak-and-dagger Peronist movement that feel the Kirchners have not only let them down but have also betrayed their interests. No one has been more relegated by the Kirchners than former president and powerful Peronist kingpin Eduardo Duhalde, who plucked the late President Néstor Kirchner from the obscurity of a southern Patagonian governorship to launch him overnight into the presidency following a major political crisis that rocked the country’s institutions, only to be paid back with ingratitude and disdain by both Kirchner and his widow, the current president. Or could it be the Kirchner government itself? Its popularity has plummeted in recent months. The highly successful middle-class 8N demonstrations and successive open protests by Peronist labor unions and leftist workers movements have constituted the proverbial writing on the wall in this regard. Nor has the government been able to make good on its raison d’être: the destruction of the Clarín media group. In the meantime, it has embarked on such obviously inflammatory moves as its plan to take over the traditional Palermo Fairgrounds in Buenos Aires from its clear-cut political rival, the Sociedad Rural Argentina, which groups the most powerful and conservative ranchers and landholders in this agriculturally rich nation. Drawing battle lines between the country’s poor and its well-to-do would be the worst possible thing that could happen to Argentina, but this government has never shown any sense of moderation and less still any spirit of cooperation and social harmony. It is a government that fosters head-on conflict constantly and which is adept in the use of lies and subterfuge for short-term political gain. If it thought that plunging the country into chaos might cover up a multitude of sins, while providing it with an excuse to invest itself with special powers, who—based on its performance up to now—could doubt that it might well do so? 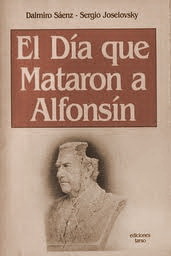 In his highly controversial 1985 novel entitled El día que mataron a Alfonsín, Argentine author Dalmiro Saenz (in collaboration with Sergio Joselovsky) crafts a meticulous (and terrifying) blueprint of how mob violence is used in Argentina to hold democracy prisoner and bring about change by other means for the benefit of political power groups. What he describes is the kind of “social terrorism” witnessed in similar mass looting and rioting organized against the extraordinarily democratic government of Raúl Alfonsín in 1989, prompting the president to resign his post several months before the end of his six year term. 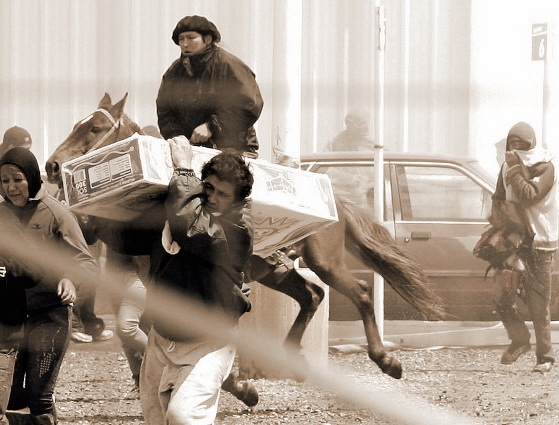 And this was also the same sort of organized violence that cut short the elected government of President Fernando De la Rúa in 2001 and cast the country into institutional chaos for two years thereafter, until the democratic election of Néstor Kirchner in 2003. Saenz and Joselovsky make it clear in their book that in organizing such movements, the whole idea is to create suspicion and confusion by destroying every landmark with which a society can orient itself. And therefore, nothing is as it seems and anything is possible. I think it’s safe to say that Dalmiro Saenz would probably agree with the last part of that assessment. Perhaps he would even applaud it, since the whole idea of the book was to create a veritable X-ray of the inner workings of a “popular” coup and of who might benefit from it. I hope so too, Martín. Loved every word, Dan. Can you see a connection with the expression "vamos por todo" uttered endless times by Ms. Fernández? Indeed I can, Marcela, as witnessed also by the government's planned takeover of the Sociedad Rural's fairgrounds in Palermo. That's an open and direct provocation of the far right that just goes to show that the last thing CFK's government wants is social harmony. It's a confrontational government that's seeking to use the divide and conquer theory as a means of perpetuating itself in power. The more likely outcome, however, will be ever-increasing conflict and chaos until the country becomes ungovernable. Those of us who have been around a while longer than most have seen this movie before. Thanks, Dan, for this excellent appreciation which came to me via Bob Cox. Glad to have found you again after so many years! The connection of "Vamos por todo" to the military dictatorship and in my view to Nazi "Gleichschaltung" is obvious - and quite alarming! Yes, we have been in this movie before! Many thanks, Gina, both for your comment and for reading me, and my deepest thanks to award-winning newsman Bob Cox for passing on the link. I found your blog through B. Cox's column in today´s BAH issue, to whom I extend my thanks for leading us to your current contributions. In the spirit of your optimistic friend's view, I would remind you and your readers, that in the Greek tradition, the last spirit to escape Pandora's box was Hope. Thank you, Rab. You're very kind and I hope to have you as a regular reader in the future. In its willingness to make the country ungovernable by institutions, Peronism is the Republicanism of the South. Dan I too found your blog through the BAH and am delighted I did. As an ex-pat who has lived in Rosario for 8+ years I too am dismayed at how the mindless followers of La Reina have gone about devistating this country. Perhaps even worse than the Brown Shirts (La Campora) is the fact that Argentina cannot find an Opposition worthy of the name to combat the Kirchneristas. I look forward to your next writings. Un abrazo y Feliz 2013. And I'm really glad you found my blog, Mark. Many thanks for reading me and for your comments. I agree entirely that the autocratic style of the Kirchner regime (and especially that of CFK) never would have been possible without the enablers in the opposition who, with very few exceptions, have limited themselves to simply sitting on their hands and waiting,or to standing essentially mute (providing tacit authorization) instead of actively defending the rights of the (huge) minority--if indeed it is that any longer--against the kind of abuse of democratic principles that the country has witnessed over the past decade. If this government can surely be accused of gross abuse of power and of actively seeking to divide the country between its followers and everybody else (whom it considers "traitors") then the vast majority of the opposition can be equally accused of collusion for standing idly by and letting it happen or of (as in the case of the so-called "K-Radicals") actively helping the administration achieve its ever more questionable ends. Many thanks, Javier, and thank you for reading me.